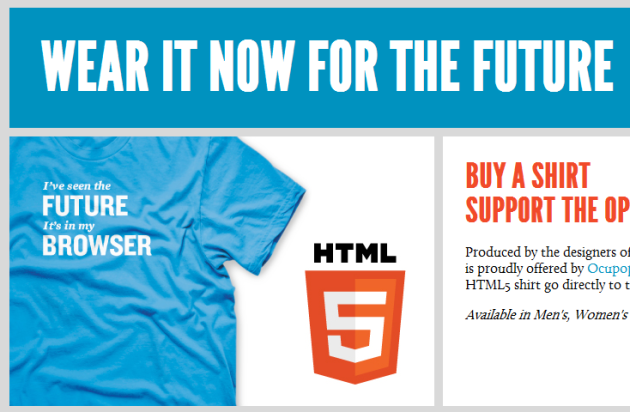 HTML5, the next major revision of the HTML standard you’ve most certainly heard of as a TechCrunch reader, now comes with added logo, courtesy of W3C. The logo is available under a permissive license (Creative Commons 3.0 By). See the FAQ section for more information and check out the badge builder. It stands strong and true, resilient and universal as the markup you write. It shines as bright and as bold as the forward-thinking, dedicated web developers you are. It’s the standard’s standard, a pennant for progress. And it certainly doesn’t use tables for layout. We intend for it to be an all-purpose banner for HTML5, CSS, SVG, WOFF, and other technologies that constitute an open web platform. The logo does not have a specific meaning; it is not meant to imply conformance or validity, for example. The logo represents “the Web platform” in a very general sense. They’re also selling T-shirts and giving away free stickers! Seriously, what do you think about the logo?